If you ask me, the image looks more like the Atlanta Hawk's Josh Smith than LeBron James. Just saying, but what do you think? 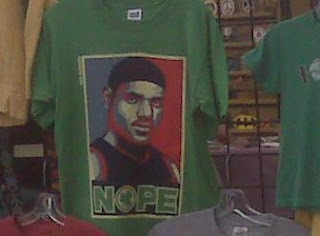 For those that are interested in purchasing a LeBron James "Hope" T-shirt, click here. will check it out. thank you for the comment. if you want to trade links with a cavs fan, lmk.